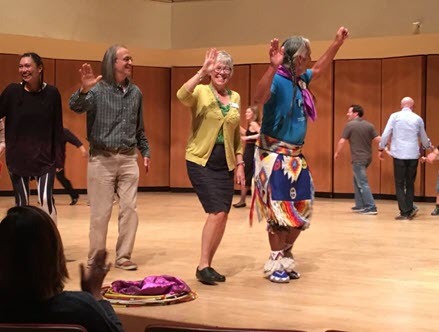 Our American Indian's Chairman participaing in a hoop dance on stage with Kevin Locke at the Indigenous Peoples Day performance at Northwestern University. Chicago Chapter supports American Indians through donations, such as supporting the American Indian Youth Camp. The chapter received proclamations from the governor and Cook County Board President delcaring November to be Native American Heritage Month. We remember Native Americans by sharing American Indian poetry, stories and music at our meetings.